Chappell: Oh yeah, I was definitely going to ask you about the original Nature Boy! Chappell: That’s right, I remember he used the bad ear gimmick to feed the crowd reactions at the house shows. Brunzell: So in the match he’s got these doggone Band-Aids on his ears, and it worked out that Steamer gave me a tag and I’m making a comeback on him and I get him in the corner, and I ripped one of the Band-Aids off his ear and he goes crazy and the fans go nuts! Then I ripped the other one off, and the fans go crazier! Chappell: Okay, now we know how Rogers always had such a good tan! Brunzell: And he was blistered! So when I pulled that Band-Aid off he screeched like an owl! Brunzell: You know, he was a character…Oh God! 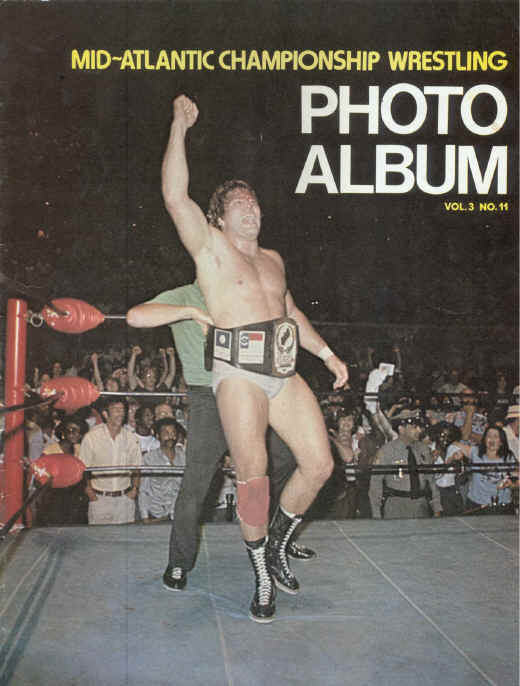 Chappell: For sure, and speaking of characters, you had an extended program in the Mid-Atlantic area with the strongman Ken Patera over the Mid-Atlantic Heavyweight Title which you won from him on September 14, 1979 in my wrestling hometown of Richmond, Virginia. 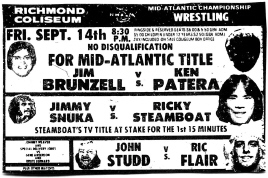 Please tell us a little about Patera and the Mid-Atlantic belt. Brunzell: Right, you know Kenny was a good heel and he was so powerful, and a great athlete. He was sort of a natural heel, because that was basically what his personality was too. And I remember George sort of let us flounder around underneath a little bit. Kenny and I had worked this deal, and we had a no disqualification match in Richmond for the championship. And I remember the finish was so unique! Brunzell: I was making a comeback and he’d stopped me and thrown me outside and he kept knocking me off and running my head into the post and then the turnbuckle and the mat and everything, and then what happened was that the referee was pushing him back, and as he pushed him back Kenny comes whipping around and I had grabbed the top rope and slung myself and jumped and actually hit him with a head-to-head shoulder block tackle and covered him one-two-three. And it got over like a son of a gun! Chappell: That’s an understatement, Jim! Brunzell: First of all, it was a great match and the finish just came out of the clear blue sky. You know, because I was still down there selling and Kenny had kicked out and he got up and threw me out of the ring and then they give me the belt and he jumps off and the people go crazy! Chappell: A magical Richmond Coliseum moment! Brunzell: You know, we had a good run with that and you know it was fun. Oh God, Richmond was a great wrestling town! Richmond was one of the best big towns that we hit in the Mid-Atlantic. I mean, you know, Raleigh was okay and Norfolk was okay and Charlotte was good, but I tell you Richmond had a beautiful civic center there and it was round and the people were with it…they had great crowds in there! Chappell: The Richmond Coliseum was the place to be on Friday nights! Brunzell: I had some really good matches there. Matter of fact, I remember I had a match there with the Iron Sheik, and after the match he grabbed something and started choking me and he choked me so damn hard that I was almost knocked out! And then he threw me out of the ring and I was sort of half conscious, and when I went out of the ring I slammed my head on the concrete and I had 23 stitches in the side of my eyebrow! Brunzell: I’ll never forget that…that was from Richmond! The Iron Sheik, Khosrow, was such a character. In my book I talk about Khosrow and the Mid-Atlantic Title. He had wound up beating me on TV using that loaded boot! Chappell: I remember that well! It’s interesting that three Mid-Atlantic opponents we have talked about, were in that 1972 training class with Verne! Chappell: Yeah, I think you said Johnny Weaver had helped you perfect the sleeper. Brunzell: And Sandy says, ‘Well, that’s what George wants.’ I was furious. It was funny, I got home that night and I saw him in Charlotte and I took him aside and I said, ‘George, you might as well have buried me in the middle of the ring in Norfolk, because I’ll never draw another dime there.’ And he just didn’t get it, you know. He was so lucky that the Mid-Atlantic drew so well and had such great talent. Again, I’ll say I like George but his booking was horrible; his finishes were horrible. Brunzell: Well, I thought the same thing David. And you know, Ray was one of the greatest of ALL talents. Brunzell: He was just incredible, and he and Nick Bockwinkel were AWA Tag Team Champions. He was HUGE out in San Francisco in the middle 60s to the early 70s. And Ray was the type of guy, you know, you could go in the ring with him and have a hell of a match, and he might not have slept for two days! Brunzell: He was incredible! And there were very few guys like him. I’ll say Ric was very much like Ray Stevens. Bobby Heenan was exactly the same; these guys were all naturals. Chappell: I have heard Ric say that he emulated Ray in a lot of things he did. Chappell: You worked with so many true legends like Ray Stevens over the course of your career. Were there any legends that you never worked with that you wish you had? Brunzell: I was so fortunate that I had the opportunity in my early time at the AWA to work with all these great guys. And I did go to Kansas City and I saw Jack Brisco and I saw Terry Funk. And then when I went to Charlotte I worked with Terry Funk in a couple of shots. And when I went to Atlanta I worked with Dory Funk, Jr. But I never did get to work with Jack Brisco, who I REALLY admired! I thought he was one of the great champions. Brunzell: Just an INCREDIBLE presence in the ring. To Be Continued in Part 5!